Hawai’i made history earlier this year when its legislation passed a law that requires the state to derive 100% of its energy from renewable sources by 2045. It’s the first state in the US to enact such a law, but it isn’t the first community to strive for energy independence. There are now a number of small communities around the world that have become 100 percent-ers, from Georgetown, Texas in the US to the Orkney Islands of Scotland. A common thread between these communities has been the desire (or economic need) for a fixed rate plan for utilities against the oscillating prices of power derived from fossil fuels. A fixed rate is something the current grid systems used throughout the developed world do not offer. Hawai’i is the first state in the US to set a 100% renewable energy target. The legislation, which was approved last month, was drafted by The Blue Planet Foundation. Hawai’i already generates over 20% of its electricity from renewable sources such as wind power, solar power and geothermal power. The amount of electricity generated from such sources has doubled in the state over the last five years. Under the new legislation, the state must reach 30% renewable electricity by 2020. Penalty for missing goals will cost Hawai’i’s utilities an extra 2 cents per kilowatt hour of fossil-fuel derived power. 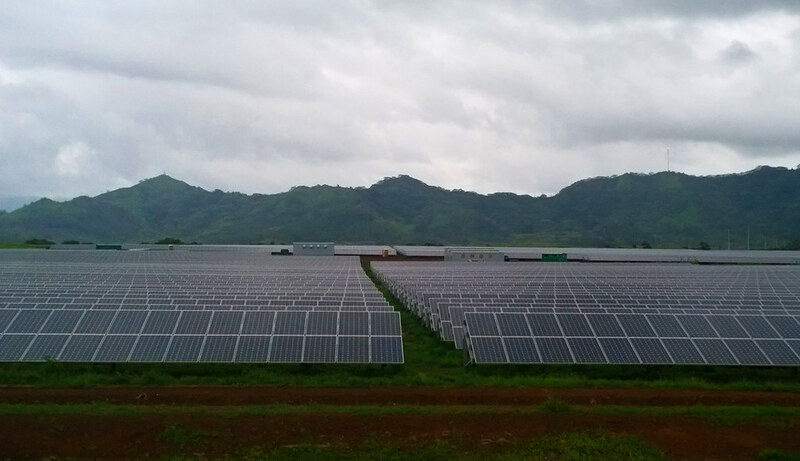 A study released by the Hawai’i Natural Energy Institute (HNEI) at the University of Hawai’i Manoa and GE Energy Consulting outlines an optimistic future for the state in achieving those goals. While there are diverse options for generating power from renewable sources for Hawai’i, the largest obstacle is energy storage, the study found. The study looked at a combination utility-scale wind farms and solar installations, as well as consumer-side rooftop photovoltaic systems, which are becoming more popular as the price of solar panels continues to decrease for consumers. The Orkney Islands, located off the coast of Scotland, has already achieved the 100% milestone in renewable electricity. It now produces more electricity than it can use, with over 700 grid-connected clean energy generators. The Orkney Islands experience strong winds and tidal currents that make it an ideal location for off-shore wind farms and tidal energy converters. The Islands also see a fair share of residential wind turbines, which help to power the fleet of electric vehicles that residents use to get around. In 2013, Orkney generated over 100% of its electricity needs. The state of Vermont has enacted a goal of reaching 90% energy generation from renewable energy sources by 2050, but Burlington — the largest city in Vermont — became a 100 percenter community in the fall of 2014. Through acquisitions and imports, the city’s electricity utility company Burlington Electric Department can now meet the city’s electricity demand with energy from renewable sources such as wind, biomass and hydro. It reached the milestone last fall when it purchased a 7.4 megawatt Winooski One hydroelectric project. The city receives about a third of its power from hydroeletric projects, a third from a biomass plant that burns woodchips, and a third from wind energy contracts. Georgetown is a 50,000-large community north of Austin, Texas. It’s the first city in the state that will be powered 100% by renewable energy, though it hasn’t reached the milestone yet. The community’s power is supplied by one company, owned by the city, which is a rarity in the state where utilities are de-regulated. Through a deal the municipal utility company contracted with SunEdison, one the largest solar companies in the world, and a deal the city signed in 2014 with EDF Energy involving a windfarm near Amarillo, Georgetown will rely 100% on wind and solar power for its electricity needs by 2017.